Last night’s 6-3 win against the Boston Bruins was a big one for the Tampa Bay Lightning. Trailing those same Bruins by five points for the final wild card spot, the Lightning were in a precarious position. A loss would put them seven points out of a playoff spot and a Sisyphean climb for a playoff spot would ensue. But the Bolts pulled out the win with four unanswered goals, three of which came in the third period, and were led by a Nikita Kucherov hat trick. Kucherov has been instrumental in salvaging the Lightning’s season and playoff hopes. His play over the course of the past two months has been Hart-worthy and his performance Thursday night has put him in the same class as the great Lightning single-season performers. His third goal Thursday night was his 37th on the season. The goal put the Russian winger in the top 10 single-season goals scored in Lightning history. With nine games left in the season and every one of those nine being must-wins, it is likely that Kucherov will reach the 40-goal mark for the first time in his career. Reaching 40 goals would be a great feat considering that, since the lockout in 2012-13, it has only happened 11 times — that includes Sidney Crosby reaching that mark this season. These days, scoring 20 goals is considered a “good” season, 30 goals is a “very good” season, and anything north of 40 goals makes you elite and puts you in rarefied air. With the hat trick Thursday night, Kucherov put himself in a tie, with Boston’s Brad Marchand, for second in the goal scoring lead, both behind Crosby. A Maurice “Rocket” Richard trophy is not out of the question, especially with how sizzling Kucherov has been and Alex Ovechkin mired in a goal scoring drought. Ovechkin’s run of four straight Rocket Richard’s will almost certainly end this season and if Kucherov should end the season with the most goals in the NHL he would join Vincent Lecavalier (52 in 2006-07) and Steven Stamkos (60 in 2011-12) as the only Lightning skaters to do so. The award would no doubt be a great honor for him, but it would be much sweeter if it came with a postseason spot and a run in the Stanley Cup Playoffs. As mentioned, Kucherov entered the top 10 of Lightning single-season goal scorers with his 37th Thursday night. He likely will not reach the all-time mark of 60 goals by Steven Stamkos, but if he reaches 40 goals he would become the first Tampa skater other than Stamkos to net that many since Martin St. Louis and Lecavalier did it in 2006-07. He would also become just the fifth player in the 24-year history of the Lightning franchise to tally 40 or more times, joining Lecavalier, Stamkos, St. Louis, and Brian Bradley, who accomplished the feat in the Bolts’ first NHL season in 1992-93. The Lightning may be a young franchise compared to 73 percent of the league, but it is a great accomplishment nonetheless and it would secure him in Tampa Bay hockey lore forever, especially if it accompanies an improbable spot in the playoffs. Kucherov’s season has been special and you cannot discount it as one of the best in the team’s history. With Stamkos’ absence he’s had an albatross on his back, yet he has not disappointed. He seems to have relished the opportunity to carry the team and that burden does not seem too heavy for him. 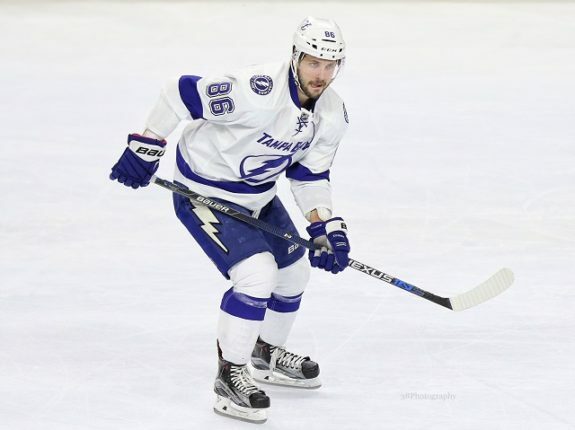 If the Lightning do not make the playoffs, there will be many areas and factors to examine as to why they underachieved — Nikita Kucherov will not be one of them.